His full name is Captain Douglas Jay Falcon -- the mysterious F-Zero racer who drives the Blue Falcon -- although that's probably about as much as we'll ever know about him. It's rumored that he's called "Captain" because he was once an officer on the Internova Police Force. But Captain Falcon is nothing reminiscent of a bobby in Super Smash Bros. His moves seem to be a mix between Kung Fu and street brawling. In the original Nintendo 64 version, Captain Falcon was infamous for his flaming Falcon Punch. Probably his most devastating move, the Falcon Punch could deliver a blow worth 25% damage. However, it's something that's slow to action and because he does scream out "Falcon Punch" prior to moving into action, it's easier to avoid. Although the Captain was a secret addition in the first game, in SSBM he is a selectable character right off the bat. Captain Falcon is one of the fastest characters in Smash Bros. Melee and is definitely much quicker than his clone, Ganondorf. One would think that his light weight would mean he has less powerful attacks, but that's not true in the least. Also, due to his lighter state he's a bit easier to knock off of the screen. He is the second fastest character in SSBM, only falling behind to Fox. This makes him very agile and is what you need to take advantage of most. 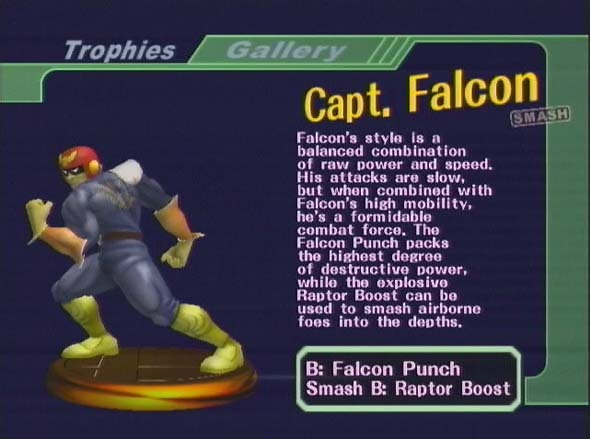 Falcon is truly a great character in SSB Melee (despite his flamboyance) simply because he's so well balanced. Each and everyone of Falcon's moves has a potent effects. His main smash attack, (Forward/Backward + A), the Falcon Elbow, is very powerful whether charged up or not. Use this as all opportune times. You can really grab some easy KOs in that way. Equally powerful, in fact one of his most powerful attacks, is his double high kick. By charging Falcon's Up+A smash attack you can deliver a considerable amount of damage. If you get surrounded by characters, remember he has a double sweep Down+A smash attack. It will hit on both sides of him with a lot of force, so it comes in handy if you've got foes coming from both sides. What would Captain Falcon be without his Falcon Punch, though? Simply tap the B-button to begin his most powerful attack. The problem is, the move takes a while to charge and he alarms everyone by yelling out its name. That said, you'll need to be quite tricky yourself. Sneaking up behind someone in a four-player match is doable, but you may as well work on some better tactics. Try starting it while in midair, so he's actually punching just as he hits the ground. It leaves you vulnerable, but it's the best way to fool your opponents. And, remember, that the Falcon Punch is less effective the farther away he is from them. Try to use it when you're in direct contact with your opponent. One of Falcon's most strategic attacks, though, is his Right+B flaming uppercut. It sends players directly above him and this can be used for several things. Depending on their height, you'll want to use different moves. For someone who has little height, use his double high kick. However, if you have enough time try lining up his Up+B Falcon Dive. He sends foes exploding out from him for fairly considerable damage. This is also his third recovery jump. So, depending on your angle you can actually grab someone before you even make it back to the stage. The move can be used repeatedly, one after the other, and actually sends Falcon higher than his opponent. So it's handy all around. Another interesting fact about Falcon is that when he uses the Star Rod, it fires four stars at once. It's more powerful than a normal charge up, but if you're too close you can actually miss hitting opponents. In truth the Star Rod is much more effective when slammed upon someone's head. Our best tip we can give you is just to use Falcon's balance. He's really powerful in midair as well on the ground, so be very offensive and use his speed to dodge attacks. You could actually benefit most from running in and out of battle repeatedly. Oh, and if you haven't noticed his taunt (D-pad up) is incredibly lame and annoying. If you do choose to use Falcon, use the taunt often. Even better, get together with a friend for Team Falcon and enrage your opponents. Works like a charm. All moves are based on a character facing to the right. Origin: Falcon was thrust into the limelight when F-Zero launched on the Super Nintendo Entertainment System (SNES) because he was the star character. The title featured some of the most gorgeous two-dimensional Mode 7 scrolling effects available at the time. On top of that it introduced the idea of blazingly fast, futuristic racing like no other before it. It took Nintendo another eight years before they realized that vision in 3D on the Nintendo 64 with F-Zero X. Outside of the 64DD add-on expansion kit, Captain Falcon hasn't seen a star role since. Super Smash Bros. and Super Smash Bros. Melee are his most recent stomping grounds. Nintendo released F-Zero for Game Boy Advance, but Falcon was nowhere to be found in a world that was set hundreds of years in the future after his time.